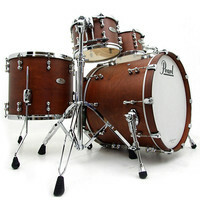 The Pearl Reference Pure series builds on the Pearl Masterworks philosophy to empower drummers with the ultimate in drum resonance and clarity. Every aspect of these stunning kits has been designed to maximise the quality of tone for the most demanding drummers in the world. Featuring ultra thin shells Reference Pure kits allow better vibration from the drum head to the actual shell whilst the 45 degree bearing edge provides pinpoint articulation of your playing. The tom OptiMount suspension system also reduces surface content for maximum resonance.